As a small business, you don’t have a huge marketing budget. And traditional marketing tactics — like print marketing, TV and radio ads, and direct mail — can add up quickly. How can you reach new customers without breaking the bank? With newer online marketing channels, small businesses have never had more access to cost-effective, trackable marketing tools. Need some ideas to ramp up your online marketing? Here are six easy ways that successful businesses are reaching new customers online. Email marketing isn’t the newest marketing channel around, but it continues to be one of the most effective. With an average return of $38 for every dollar spent, email outperforms digital marketing tactics like social media and paid search. If you’re new to email marketing, getting starting is easy. Sign up for an email marketing provider, gather contacts online by adding a sign-up form to your website, and start sending professional messages using a mobile-responsive email template. Want to see how email marketing can drive real business results? Join us for our FREE webinar: The Power of Email Marketing to see the tested tips and tricks you need to succeed. 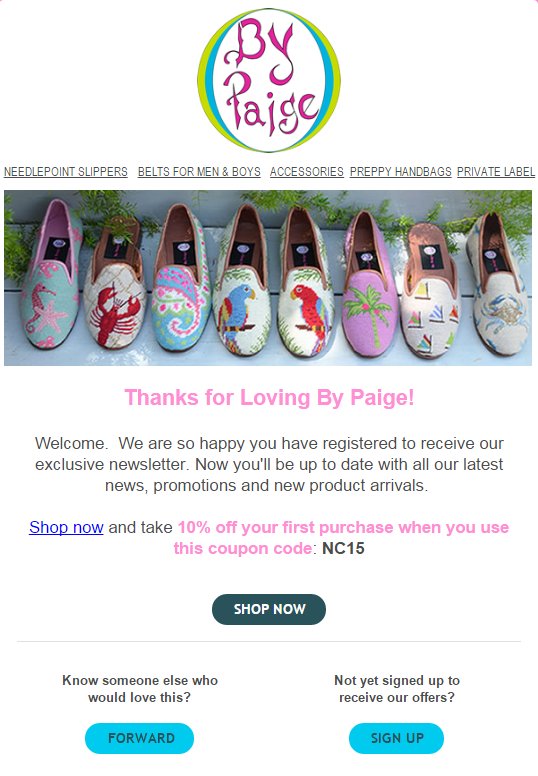 Businesses like By Paige convert website visitors into customers by offering email subscribers 10 percent off their first order. How could your business entice new customers to join your email list and make a purchase? Easier said than done, right? You’re not a writer and you don’t have the time. But what if you thought of your blog as a written record of the questions your customers ask you all the time? Wouldn’t that actually be a time-saver if you had a resource at the ready to point to? On the Constant Contact Blog, we answer frequently asked questions like What is email marketing? or What’s the Best Length for My Email Newsletter? Publishing helpful posts gives you an easy way to show off your expertise and reach new customers when they search for answers online. Blogs are also a great way for people to find out more about your business and the products and services you offer. If you’re really strapped for time, see if a staff member or loyal customer would be interested in contributing some articles. Oftentimes, a business can very successfully ask their fans to write a short post about an experience with the company, how they use certain products, or other relevant topics. Brainstorm some blog post ideas and ask a few fans if they’d like to contribute their perspective. There’s a good chance they’ll be excited to get involved, and once their post is published, they’ll be eager to share it with their own audience. No one likes to miss out on something fun. If you encourage your current customers to share photos of themselves enjoying an experience, their friends will be soon to follow. This is a great way to reach new people without a lot of effort. 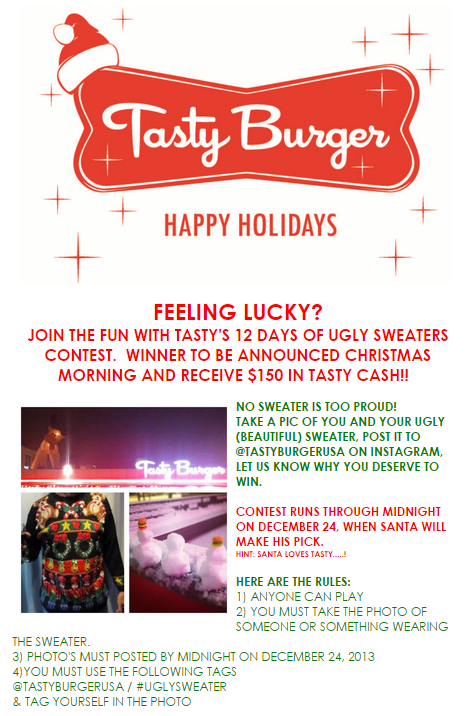 Create a timely contest that’s easy for people to participate in like Tasty Burger. They held a holiday photo contest and offered an enticing reward to encourage participation. Think about how you could run a timely photo contest to get your customers to generate some hype for your business. Does your business have a presence on review sites like Yelp, Foursquare, or Angie’s List? Expanding your number of reviews can be one of the best ways to make a great first impression on potential customers. Of course, you’ll want to collect authentic reviews from customers who love frequenting your business. Post a call to action on your Facebook page and in your next email blast to ask loyal fans to share a review. Often all it takes is a reminder to your fans that they can help you by adding their own personal review. When was the last time you asked your existing customers to refer your business? Word of mouth referrals are some of the most effective ways to reach new customers, but many businesses shy away from making an ask. Don’t let the fear of rejection stand in the way of reaching new customers! Even if only a couple people say yes, you’ll get in front of some valuable new customers. Make it easy on yourself by sending a personal appeal to your loyal email list. 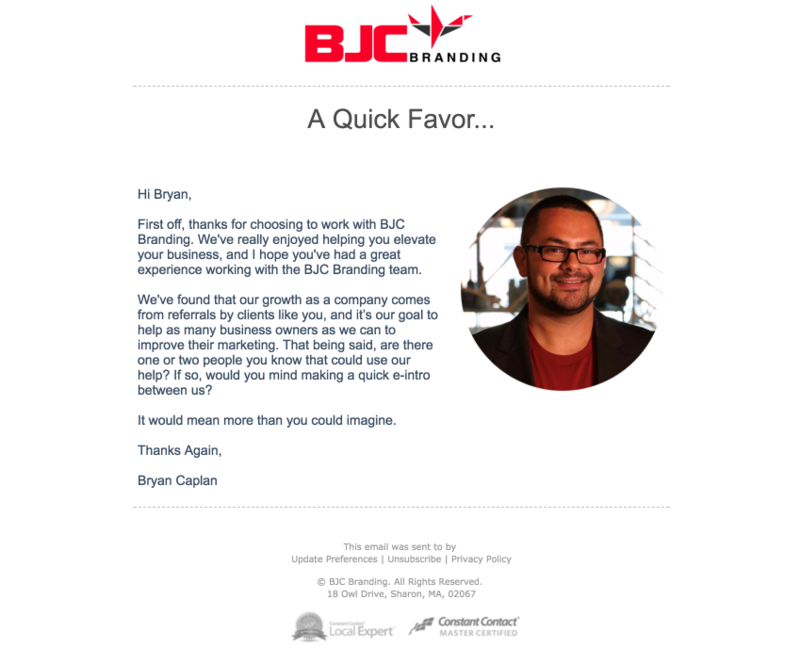 Marketing consultant, Bryan Caplan, recently sent the email appeal below to his email list and received 26 total referrals. Ask and you shall receive! Reaching new customers often starts with understanding your current customers. Do you know how most of your customers found out about you? Do you know what products, services, or topics they’re most interested in? You can write a survey or send them a quick poll to get a better sense of their interests and behavior. For example, if you learn many of your customers found out about you through a specific review site, consider doubling down on your efforts there so you can continue attracting new customers through that specific channel. Ready to expand your audience on a small business budget? Combine cost-effective online marketing tools with the support of your existing customer base and you’ll be unstoppable. Get started today by sending an email to your customers and telling them one easy way they can help you grow your business. Who knows? They might just introduce you to your next best customer. Send your existing customers a quick email today! New to email marketing? Try it out free for 60 days. Editor’s Note: This post was originally published in May 2015 and has been updated for relevancy and accuracy.